It’s that time of year of again. The days get a little longer, the temperatures get a little warmer and Hearthstone unleashes the first expansion of its new year. Year of the Dragon bids a fond farewell to Kobolds and Catacombs, Knights of the Frozen Throne, and Journey to Un’Goro. Cards from Witchwood, Boomsday Project and Rastakhan’s Rumble remain in standard play. On April 9th, the new cards from Rise of Shadows will join them. Rise of Shadows introduces three new mechanics: Twinspell, Schemes, and Lackeys. Twinspell works a little like Echo except it only gives you one copy into your hand but the copy doesn’t disappear at the end of your turn. Lackeys are 1/1 minions with interesting Battlecries, generated by playing other cards. Schemes are cards that grow in power each turn they sit in your hand. The number on the Scheme card connected to the rest of its effect will increase each turn. On Twitter, Game Developer Peter Whalen said there’s no cap on how high Schemes can go assuming, of course, you can stay alive with it in your hand. Functionally I’d expect most will top out around 7 or 8. Paladin’s Lightforge Blessing gives your minions Lifesteal (heal). The Forest’s Aid summons five 2/2 Treants. Unleash the Beast summons a 5/5 Wyvern with Rush. Ethereal Lackey discovers a spell. Faceless Lackey summons a random 2 mana cost minion. Goblin Lackey gives a friendly minion +1 attack plus Rush. Kobold Lackey does two damage like Journey to Ungoro’s Fire Plume Phoenix. Witchy Lackey transforms a friendly minion into one that costs one mana more like Master of Evolution from Whispers of the Old Gods. How do you get these wonderful minions? 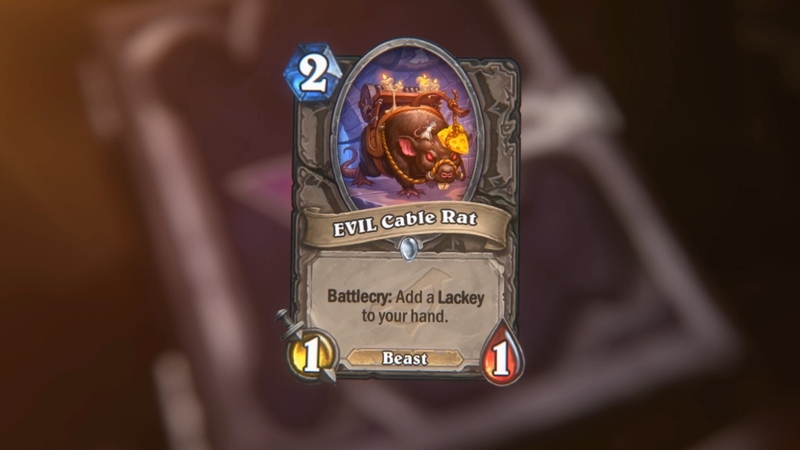 Everyone can get in on the fun with Neutral cards like EVIL Cable Rat, and EVIL Miscreant. 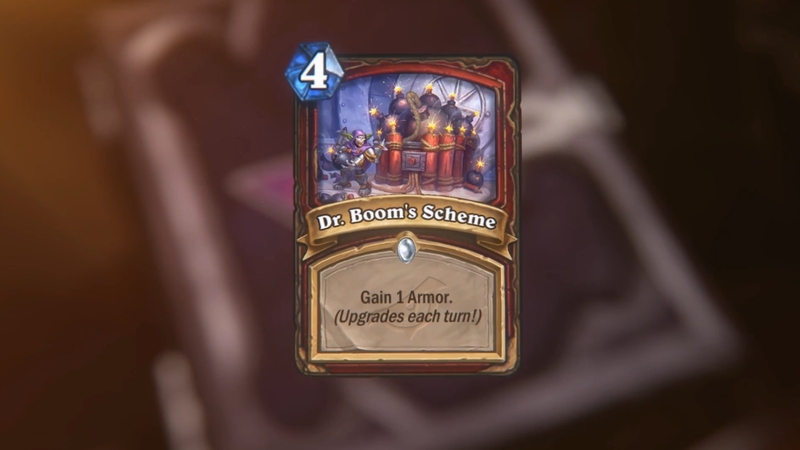 Dr. Boom’s Scheme (Warrior) gains armor. Lazul’s Scheme (Priest) reduces the attack of your opponents minion for one turn. If you use a Cabal Shadow Priest to ‘change their minds’, they will keep the attack reduction on your side of the board. Rafaam’s Schemes (Warlocks) summons Imps. Sort of a version of Forbidden Ritual, but sometimes a less expensive Fiendish Circle. Hagatha’s Scheme (Shaman) does damage to all minions. After 4 turns, you’ve got a 5 mana Flamestrike. It’s as close as Shaman gets to replace Journey to Un’Goro’s Volcano. Togwaggle’s Scheme (Rogue) shuffles minions into your deck. We need to talk about Togglewaggle’s Scheme. Some suggest trying to make a Pogohopper deck finally work, or bomb shenanigans with Seaforium Bomber. I want to try Togglewaggle’s scheme in a Tess Espionage deck and use Togwaggle on Tess herself. Can you imagine 6 or 7 Tesses (Tessi?) waiting in the deck to unleash their Battlecry? Notice it doesn’t say friendly minion. You can choose any minion with this bad boy. Why yes, I’ll take a half dozen Shudderwocks — thank you for playing yours. Jan’alai, the Dragonhawk summoned a Ragnaros, that’s cute. How about I Scheme eight of them into my deck and then Unidentified Contract to kill yours? Unlike many of the other schemes, this one is even okay as a top deck since its only 1 mana. Remember you’re guaranteed a Legendary from Rise of Shadows in your first ten packs. In the past, Blizzard has offered several packs upon log in, so I’d expect them to do that again. If you’re mainly interested in the single player adventures slated for May, you may want to budget your gold accordingly. 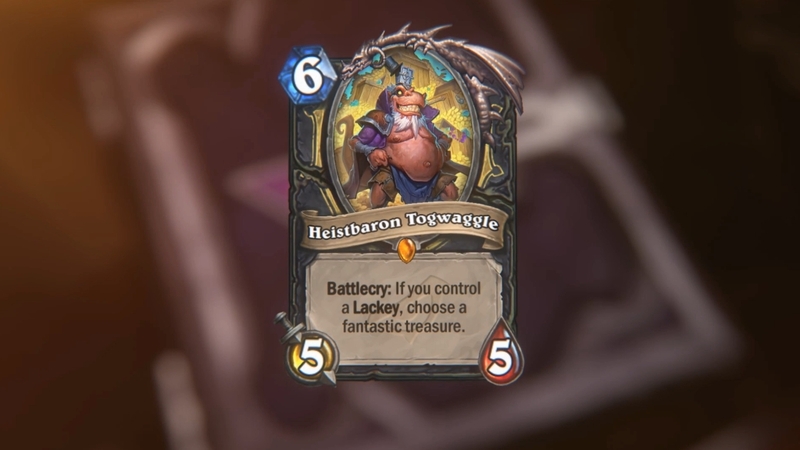 Heistbaron Togwaggle is a replacement for Kobolds and Catacombs’ Marin the Fox the same way Tom Hiddleston is a replacement for Clark Gregg. Don’t get me wrong, I like Clark Gregg. I liked Marin, too, but Tom and Togwaggle are just so much better. The treasures you get from Togwaggle are the same as the ones Marin gave, but you get to choose which one you want and its a Battlecry instead of a Deathrattle. Combined with all of Rogue tricks to bounce cards back into their hand like Shadowstep, Vanish, even Togwaggle’s Scheme, not to mention Youthful Brewmaster, you could have quite a few treasures. You’ll need Lackeys to activate Togglewaggle, and Rogue has no native Lackey support, so be sure the neutral minions are in your deck. Blastmaster completes the boom trifecta of Dr. Boom, and Dr. Boom, Mad Genius. The main support card is a new rare: Clockwork Goblin. There are some additional support cards which are all Epics. Augmented Elekks and Seaformium Bombers are neutral and Elekks work well in a Tess Greymane deck. Another support card is the Warrior Epic, Wrenchcalibur. If you choose it, you can add weapon support like Upgrade or even Captain Greenskin. If Bomb decks do become a thing, Arch-Villain Rafaam can turn all those pesky bombs or Corrupted Bloods from Hakkar, the Soulflayer into beautiful Legendary cards. Khadgar could spawn a type of summoner Mage. Power of Creation discoverers a 6 cost minion and summons two copies. With Khadgar, that’s four 6 mana minions. Mirror Image gives you four 0/2 taunts, and Unexpected Results gives you four minions. Mirror Entity and Astromancer are Mage cards to support the style. Former Champ, Mechanical Whelps, and Splintering Festeroots are good neutral options for the deck, and pray to the RNG for Faceless Lackeys. The big winner is Janali, the Dragonhawk because the only thing better than summoning Ragnaros is summoning two Ragnaroses (Ragnarosi?). 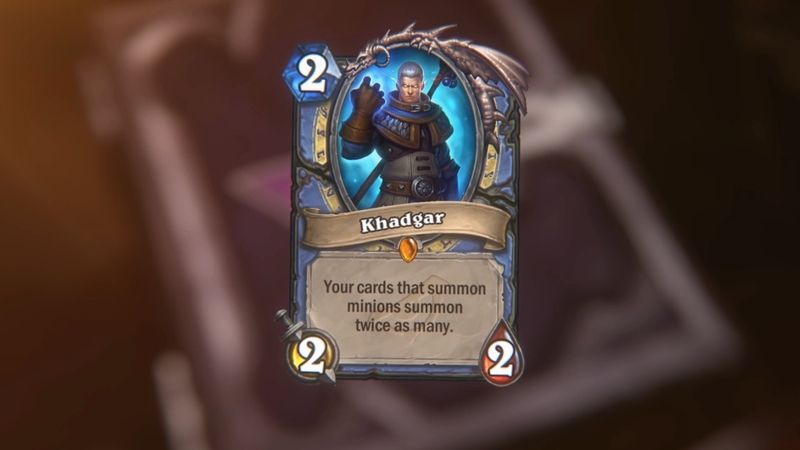 The trick will be keeping Khadgar alive for more than one turn. This happy gnome, inspired by the Miniature Warfare Brawl, draws two minions from your deck and sets their attack, health and cost to 1. Malygos decks will love him and he may let some new classes in on the Mecha’thun “fun.” While he will empower combo desks, they have a new threat in Rise of Shadows with the Hecklebot. This little guy summons a minion from your opponents deck and places it on the battlefield. If you play him early against a Mecha’thun or Malygos deck, be sure to have some single target removal ready because even though you probably ruined his win condition, you’ve still got a 10/10 or a 4/12 on the board to deal with. If you’re more of a casual player and you’re going to spend any dust, I still recommend Whizbang the Wonderful. He will still be in Standard play after his introduction during Boomsday Project. I will again state my case that he needs to reverse Hall of Famed next year, and move to the Classic set. He turns your deck into one of the 18 current Deck Recipes complete with all the cards needed. The recipes haven’t been great thus far, but Blizzard has promised improvements in Rise of Shadows. Priest is losing Kobolds and Catacombs’ Diamond Spellstone which summoned 2 friendly minions that died and could upgrade to 4 minions with enough spells cast. Rise of Shadows gives you Mass Resurrection as a possible replacement which summons 3 friendly minions. It can’t be upgraded by also doesn’t tie you down with a conditional. For Rogues, Unidentified Contract will try to replace Vilespine Slayer. It destroys a minion plus one of four other effects. Adding a Betrayal like damage to an adjacent minions, or adding the destroyed minion to your own hand are probably better than Vilespine’s 3/4 minion. Summoning a 1/1 Patient Assassin with poisonous and stealth is good but gives your opponent a chance to remove it. You can do shenanigans with the two coins, but its probably the worst of the four effects and most of the time, you’d probably rather have had the 3/4. Hench Clan Burglar takes Journey to Un’Goro’s Hallucination and puts it on a 4/3 minion. I do like the wording change so it’s more useful in a Rogue mirror match. This will help out the Burgle/Tess Rogues. Spellward Jeweler will try to do the job of Kobolds and Catacombs Kobold Monk — I think I’ve offically hit my Kobold quota at this point. Both provide a spell taunt, preventing your hero from being attacked by spells. While Monk protects you as long as its on the board, the Jeweler’s benefit last only one turn. It’s not as rosy a picture for other cards and effects. Thus far, Rise of Shadows doesn’t provide any adequate replacements for a lot of key cards for certain playstyles. The Mammoth sets provided some of the best Taunts we’ve seen in Hearthstone. Stonehill Defender, Tar Creeper, and Saronite Chain Gang provided strong early game Taunts, and Stonehill provided resources on top of that. Rise of Shadows doesn’t appear to give anything close. With those cards gone, we may see strong aggressive decks in the early days of the Year of the Dragon. Primordial Drake was another Taunt with added benefit of a board clear against smaller minions. The Lich King provided a myriad of useful effects with the card he generated. It won’t be as easy for Druid to prolong the game since they didn’t get great replacements for Spreading Plague, Branching Paths, Malfurion the Pestilent, Ultimate Infestation, or Lesser Jasper Spellstone. The developers seem to be pushing them toward token decks so far. 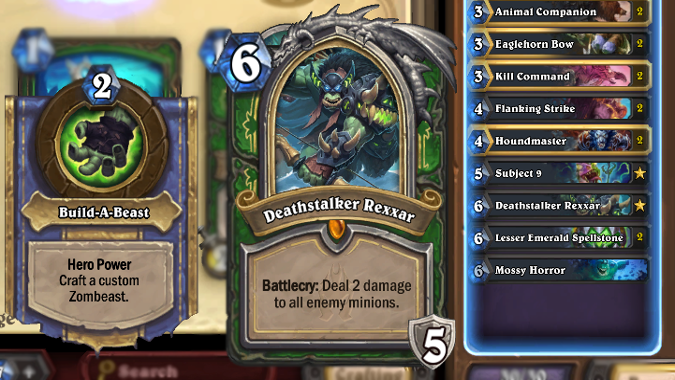 Hunter is going to see a drop in power from losing Deathstalker Rexxar, and Lesser Emerald Spellstone. Priest is losing two big AoE tools with Psychic Scream and Duskbreaker. I’m excited for the new Hearthstone year and I plan on doing a pack opening stream and opening day play on Tuesday April 9th at 8:30 CST on the Blizzard Watch Twitch channel. Stop by and check it out.